formations, located at the seashore with which it communicates through a tunnel. It also has attractive as a botanical garden, dolphin show, museum. Amenities include a restaurant, locker rooms and rental equipment for snorkeling and diving. North Paradise, Paradise South, La Herradura (incomparably beautiful), Villa Blanca Wall and Palancar Gardens. Santa Rosa is the most popular wall in Cozumel, has an area of hundreds of meters, San Francisco, Punta Tunich, Tormentos and Paseo del Cedral. Palancar, is the most famous site of Cozumel worldwide as it allows you to enjoy a veritable mountain of coral formations with unique marine life that you should enjoy. The shallow areas ranging from 6-12 m. deeper and of 30 to 37 m. has four entrances: Gardens, La Herradura, Las Cuevas and the Deep Zone, for different levels of diving. Colombia, is as beautiful as Palancar, you can enjoy a variety of coral formations which in turn formed deep canyons and ravines, an ideal place to observe anemones, fans and many attached to corals, at depths of 23 agencies and 30 mts. Punta Sur, recommended for experienced divers, with depths between 27 and 37 meters. here can you observe extraordinary landscapes and marine life without comparison. Highly recommended for night diving. For non-divers, the options do not stop being good, of course there are the beaches and the Caribbean Sea to practice snorkeling and water activities. Exploring the island is also a very interesting activity, rent a jeep and give full to the island around you will discover passages and views very beautiful, the sea on the opposite side overlooking Playa del Carmen is very different here wave is stronger for being open ocean but the feeling of the wind in your face and the majesty of the view is spectacular. Cozumel has wonderful archaeological sites as tourist center of San Gervasio, the ruins of El Caracol, El Cedral, Castillo Real, Ixlapak and Hanan, each of these sites really amazing stories to tell. It also has museums, one of the most important was the first luxury hotel opened in 1936 showing in one of its rooms a portion of one of its reefs; Lighthouse is also Celarin which shows other historical relics from surrounding lights. Playa del Carmen is a handy option too, the crossing by boat from Cozumel to Playa only takes about 35-40 min. and hourly boats leave from side to side, so if you are in Cozumel and want to take a trip to Playa to stroll through its Fifth Avenue, go shopping or "blowout" Beach, will have no problem. 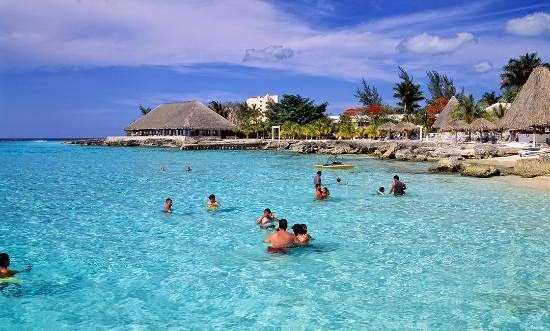 Tulum, Xel-Ha, Xcaret and Playacar, are also interesting sites that can be visited if you are staying in Cozumel, just have to make the crossing to Playa del Carmen and transported from there by bus or car to these places.